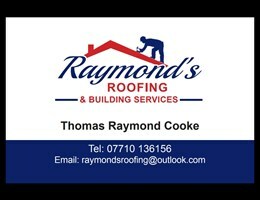 Raymond's Roofing & Building Services - Fascia/Soffits/Guttering, Roofer based in Feltham, Middlesex. Thank you for taking the time to check out our page at Raymond's roofing and building service's. We are a family run business with nearly 20 years experience. At Raymond's roofing and building service's we pride ourself in providing our customers with quality work at the most competitive rate. Our aim is to provide our customers with an affordable, professional and reliable service. New Roofs, repair or complete re-roofs. Flats roofs, GRP fiberglass or Torch on felt roofs. Chimney work, repair or removal of chimney. We are new members and have recently just joined Checkatrade for our customers benefits, aswell as ours, as our company grows. Please feel free to contact us to discuss your individual needs and requirements. We are always happy to help.